Treating documentation as code is becoming a major theme in the software industry. This is coming from both sides, with developers starting to treat documentation as a priority alongside tests and code, and writers seeing a lot of value in integrating more into the development process. This marrying of cultures isn’t simple, but having the proper tools for the job makes both sides happy with the process and the results that get produced. A lot of developer tools don’t work well for writers. Sphinx and Read the Docs are unique in this ecosystem, in that they have powerful features that both writers and developers want, in one convenient package. Read the Docs is the largest open source documentation hosting site in the world. Open Source in this context means both that the code is open source, and the documentation hosted is for open source software. It is a developer focused platform, but it has most of the features that technical writers have come to expect in a tool as well. This blending of worlds makes it the best suited platform for teams that want both writers and developers contributing to product and API documentation. Read the Docs is best thought of as a continuous documentation platform for Sphinx. Continuous documentation is analogous to continuous integration of code, which runs the tests on each commit. In practice it means that your documentation is built, tested, and updated on every commit. Sphinx provides a documentation generator that is best-in-class for software docs. Sphinx documents are written in the reStructuredText markup language. reStructuredText is similar to Markdown, but much more powerful, as you’ll see in this article. Read the Docs provides a hosting platform for Sphinx, running a build on each commit of your repository. As a writer who uses Sphinx, your day to day is writing reStructuredText in plain text files. You then build your documentation by running Sphinx on the command line. Generally it’s easiest to output HTML for local writing and testing, and then you can let Read the Docs generate PDF’s and other formats. This article provides an overview of the features of Sphinx and Read the Docs, and enables you to evaluate them for use in your organization. Sphinx is the documentation tool of choice for the Python language community, and increasingly also for other programming languages and tools. It was originally created in 2008 to document the Python language itself. Semantic referencing of software concepts, including classes, functions, programs, variables, etc. This article isn’t large enough to cover all of the power packed into this tool. But I hope to show enough to pique reader interest so that you can try these tools out and research their capacity for yourself. An overview of the admin control panel. Here warning acts as the name of the directive, and is the part you can extend for custom directives. In the figure, screenshot-control-panel.jpg is an argument, :width: is an option, and the rest is the content They enable customization of directives, and show the full power of reStructuredText. You’ll notice that Sphinx uses whitespace to denote where a directive ends. The “Proceed with caution!” is still part of the warning, and everything that continues to be indented will be part of that warning. Sphinx ships with a number of powerful directives for documenting code. You can also write your own if you have someone on your team that knows Python. You can learn more about this in :rfc:`1984`. Here you can see rfc and class act as the name of the role, and then you can pass in a single argument. For the rfc role, it generates a link to the online reference for RFC 1984 with a text of RFC 1984. The class role is where things get interesting. This acts as a reference to the class System.Security that is documented in your project, which is a hyperlink in the HTML output, but also a working link in PDF and other outputs as well. Check out :jira:`199` for information on the :toy:`jump-rope`. There is a fix in our :unit-test:`assert-jump-rope-length`. These custom roles work in your .rst files, but also in any kind content that is pulled out of a comment in your source code too. Now, let’s see how you take these sets of reStructuredText files and turn them into a document set. Sphinx lets you combine multiple pages into a cohesive hierarchy. The toctree directive is a fundamental part of this structure. The TOC Tree is also used for generating the global navigation inside of Sphinx. The index at the top of your project acts as the root of the navigation. The toctree is quite important, and one of the most powerful concepts in Sphinx. The neat addition here is the :emphasize-lines:. This shows the lines highlighted in your output. This is quite useful for showing sets of code examples where a subset of the code changes. You can also specify just a subset of lines to show with the :lines: option, so you don’t have to manage multiple snippets. A powerful reference system is a large part of the power of Sphinx. You are able to reference arbitrary headings and paragraphs in your content, but also semantically reference a large number of programming concepts as well. On top of that, Sphinx includes intersphinx which allows referencing across Sphinx projects. This means that if you have multiple projects inside your company, you can still use semantic referencing across them! This is a bit of content. Which would know to look in your api-ref project for the class. The name api-ref is arbitrary, and is defined in your project configuration’s intersphinx_mapping. Integration with code is one of the largest benefits of Sphinx. You can easily embed software comments from multiple languages, including Python, Java, and .NET. You can make requests using the :func:`api.request` module. It makes HTTP requests against our website. As you can see, you can include generated content in the file that you’re writing by hand. This allows for building a narrative around generated code comments, instead of giving your users a separate User Guide and API Reference, which is often times just an alphabetical listing of code! Documentation is best written by humans. Pulling comments from source code is valuable, but it should be a small part of a proper set of documentation. Working with tables can be the bane of anyone who uses plaintext markup languages. Most other languages require that you write them in the file with some arcane syntax. However with reStructuredText, you can use directives to make this much easier. "Popcorn", 1.99, "Straight from the oven"
This shows the inline markup, however the CSV can also be managed in an external file. This allows you to manage your complex tables in a third party tool, and have your documentation consume them from a CSV which is a much nicer workflow. 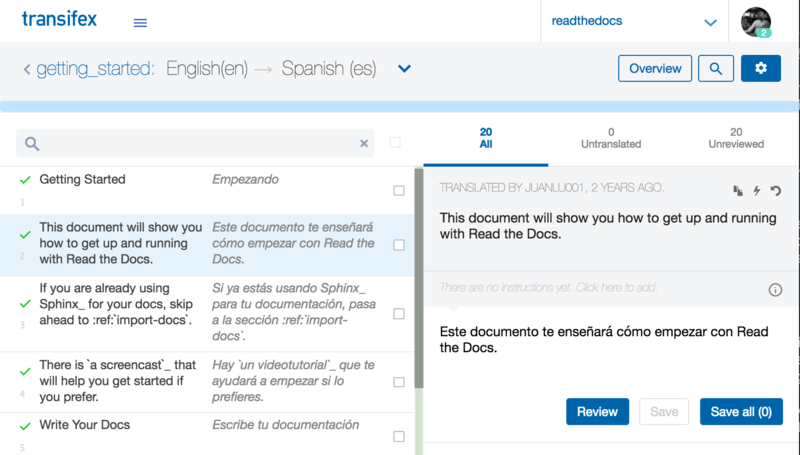 Sphinx includes support for translating documentation into multiple languages. Since sphinx knows the structure of your documents, it is able to generate a translatable strings split by each paragraph, heading, or figure. You can then tell Sphinx what language to generate for its documentation when you build it by setting the language setting. Read the Docs also supports internationalization, allowing you to host multiple languages of your project documentation. Sphinx is quite versatile, which means you can use it for a lot of different use cases. I use a package called ablog for hosting of my blog over at http://ericholscher.com. You can get as creative as you like with custom builders, which is another place to extend Sphinx outside of the markup. Every tool has its issues and limitations. I’d like to address some of the issues with Sphinx, so that you can go into it with eyes wide open. The biggest issue is that it is originally a programmer tool. This means that a lot of the designs assume knowledge of code, especially for installation and extending the tools. Knowledge of the command line is definitely required. The markup language, reStructuredText, is also a bit finicky. It depends on whitespace for separation of content, which is a natural concept for Python programmers, but not for most writers. In general though, a lot of the complexity in the language comes from the extensibility and power. When compared to something like Markdown, reStructuredText can do so much more that it’s worth the complexity and somewhat steep learning curve. Read the Docs is a hosting platform for Sphinx-generated documentation. It takes the power of Sphinx and adds version control, full-text search, and other useful features. It pulls down code and doc files from Git, Mercurial, or Subversion, then builds and hosts your documentation. We’ll use GitHub in this example as it’s the most commonly used system for accessing code. To get started, you create a Read the Docs account, and link your GitHub account. Then you select the GitHub repository you’d like to build documentation for, at which point the magic happens. Build HTML, PDF, and ePub versions of your documentation from your master branch. Now, whenever you commit new code or documentation to your repository, your documentation is kept up to date. This works with your master branch, as well as any other branches or tags you might have activated documentation for. These are version aliases that help maintain stable URLs for the most up-to-date commits or for the most stable released version of your software. We built Read the Docs to be “set it and forget it”. Once you set your project up and activate the versions you want hosted, we sit downstream of your version control system and just keep your documentation up to date. It feels pretty magical once it’s set up, and takes the thankless task of deploying documentation out of your day. Read the Docs only works with version control. This means that however you version your software, your documentation follows suit. This is great for integrating with your development team, but it also means you need to think about the proper strategy for versioning. We recommend release branches because it allows you to update them over time. Git tags are static, so they are appropriate for specific versions that a user might have installed. Feel free to email me or find me at a conference if you want to talk more about these concepts, or have ideas for other neat features. Read the Docs has a large number of users across many different programming languages. This is in part because Sphinx is such a powerful and dynamic tool, and Read the Docs makes it easy and free to host docs for your open source project. As you can see, a wide range of projects are using the tools for many different uses. It’s a powerful tool for writing prose as well as documenting source code. Sphinx is an incredibly powerful tool. Read the Docs builds on top to provide hosting for Sphinx documentation that keeps your docs up to date across versions. Together, they are a wonderful set of tools that developers and technical writers both enjoy using. I firmly believe that the more integrated with the product development process technical writers get, the better our products get. Tools that integrate documentation and development workflows make it much easier for writers to become part of the larger development process. Sphinx and Read the Docs have been battle tested by hundreds of thousands of open source developers for years, and are a great choice for your software documentation project. Eric Holscher offers consulting and contracting on work related to Sphinx. If you want help implementing it in your organization, feel free to reach out and hopefully we can work together.